Rice and McIntyre finally have the alien suspected of murder cornered. Can they evacuate civilians from the area before McIntyre's itchy trigger finger escalates the situation even further? One of the great features of 'Port of Earth' that I've mentioned before is the great dialogue in the discussions between journalist Julia Campbell and ESA head Tom Rutgers.It's nice to see some actual journalism taking place somewhere these days and Julia deftly asks probing questions about the state of the port and the escalation of terrorism She holds him and his department accountable for the seemingly out of control nature of this arrangement with the Consortium. Rutgers smoothly plays down the events and deflects the criticism of the aliens to what humans can do. This type of exposition informs us of the broader aspects of this alien port on earth and its consequences. It's the macro to the micro of the ESA agents in and around the port trying to contain the spread of rogue aliens. In cornering the alien suspect, Rice has to try to apprehend the culprit while protecting the civilians nearby and keeping McIntyre in check. His gung-ho attitude could end up killing someone and it isn't long before the tense stand-off escalates in a major way. Without giving away the details of the confrontation, the resulting aftermath leads to more questions than answers. By issue four, I like to see my time rewarded with secrets revealed and plotlines moved forward. This does that somewhat but mostly paints a picture of increased tension, danger, and conflict between humans and aliens. Relations on the ground are getting worse and it's just a matter of time before a much larger battle takes place before the entire relationship is deemed a total catastrophe. The next issue will need more resolution to really make this arc go out with a bang. As usual, Andrea Mutti does some incredible line work and has his work cut out for him in this fast-paced story. The tension builds and rises throughout and Mutti creates some appropriately chaotic and destructive scenes that fill each panel leaving the reader as disoriented as the characters. Vladimir Popov continues to remain subtle in his color palette choosing flat grays and greens. The art is not flashy but executed very well. 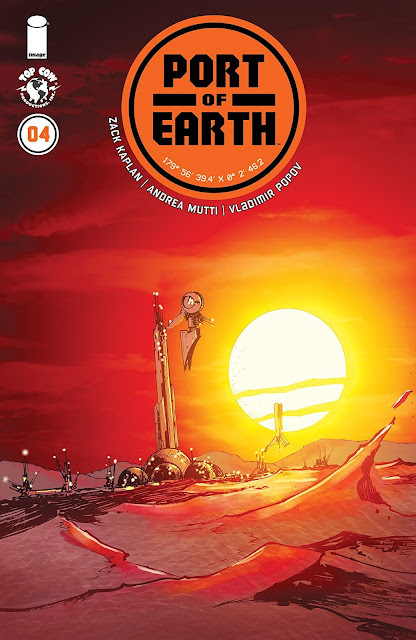 'Port of Earth' is a solid series that treats an alien partnership like the business transaction that it is with all the political trappings and conflicts that come along with it. In issue four, circumstances make this a turning point that could reveal all the ugly dealings made behind closed doors while increased alien-related violence could expose an even larger threat. Kaplan and Mutti have a smart, intriguing, sci-fi drama and just need to stick the landing on closing out the first arc.